The top quality 36mm deep artists' stretcher bars made from Baltic pine. These bars are very popular with printers because of their depth and heavy construction. They are made using an extra-strong laminated wood construction of three alternately layered lamels, finger jointed together. This minimizes warping and massively increases strength. The ends are traditional mitre-cut expansion corners. The lip of the bar lifts the canvas away from the bar and is finished to 2mm radius curve to minimise edge cracking when stretching injet prints. All stretcher bars are cut 3mm short of nominal size. 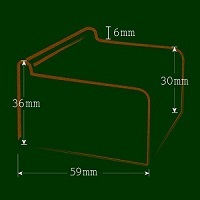 These bars are also sold as 240cm plain unfinished lengths for those who wish to mitre cut their own frames. All bars are supplied with wooden wedges.